From the Greek word "ABAX", meaning "calculating board" or "calculating table". The abacus is a calculator whose earliest known use is circa 500 B.C. by the Chinese civilization. The abacus as we know it today, appeared circa 1200 A.D. in China. It’s Mandarin name is "Suan Pan" which means "calculating plate" or calculator. It is often referred to as the "first calculator" because it was used as a mathematic model for early electronic calculators. The abacus is typically constructed of various types of hardwoods and comes in varying sizes. The frame of the abacus has a series of vertical rods (at one time perhaps made of bamboo) on which a number of wooden beads are allowed to slide freely. A horizontal beam separates the frame into two sections, known as the upper deck and the lower deck. In Asia, it is not unusual to see shopkeepers and street vendors using an abacus as a POS (Point-of-sale) device, especially where electricity is not convenient. One obvious advantage of using Abacus as a calculator is that the calculations made on an it are immediate. All one has to do is read the answer. 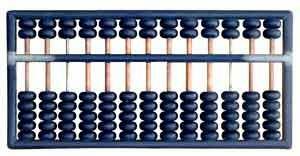 Some say that since it has a better "keyboard" than the modern electronic calculators, an abacus is actually faster when working with large amounts of numbers. But realistically, the best calculator in the world is still the HP Calculator. Tagged By: History of Calculators. good information but you could maybe have something about who invented the abacus and how. I found it very helpful though!